It has become routine for the US government to invoke human rights to justify its foreign policy decisions and military ventures. But this human rights talk has not been supported by a human rights walk. Policy makers consistently apply a double standard for human rights norms: one the rest of the world must observe, but which the US can safely ignore. Based on extensive interviews with leading foreign policy makers, military officials, and human rights advocates, Mertus tells the story of how America's attempts to promote human rights abroad have, paradoxically, undermined those rights in other countries. The second edition brings the story up-to-date, including new sections on the second half of the Bush administration and the Iraq War, and updates on Afghanistan. 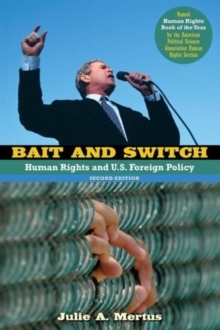 The first edition of Bait and Switch won the American Political Science Association's 2005 Best Book on Human Rights.